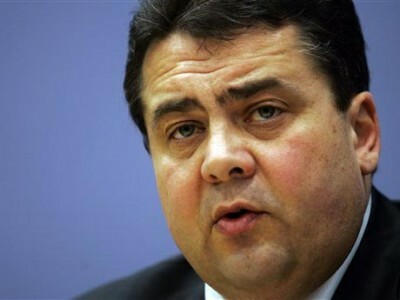 Germany’s national business daily Wirtschaftswoche here reports that the country’s Economic Minister/Vice Chancellor Sigmar Gabriel aims implement a plan that will throttle the expansion of north Germany’s onshore wind parks — due to the fact that rapid building is “overloading the power grid”. This will impact the northern states of Schleswig Holstein, Mecklenburg Western Pomerania and northern Lower Saxony. Wirtschaftswoche writes that the planned scale-back will profoundly hit the three northern states because they will receive support for only 902 megawatts of power capacity each year– far below the 1300 MW installed just in Schleswig-Holstein in 2014. 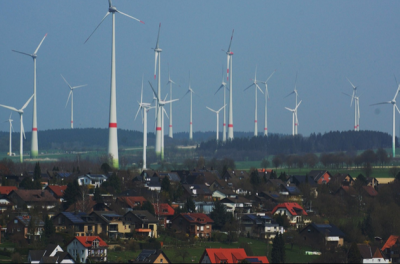 This limitation will be a major blow to the German wind industry, which is already reeling from uncertainty in the branch. Power grid expansion is not keeping pace with the growth in renewable energies. In northern Germany wind parks are often shut down because there still does not exist enough grid power transmission capacity to deliver the power to the industrial markets to the south where demand is big. The measure is expected to go into effect on March 1, 2017 and stay in effect until the end of 2020 – a period of four years. The Weltwoche writes that the German greens and renewable energy lobbyists are angered by the upcoming move, claiming that the German government is putting climate protection in doubt and that it should focus on preventing coal and nuclear power from clogging up the power grid. While Germany expresses bold intentions to make a rapid transition to renewable energies, it is in fact scaling them back. The impression that members of the Australian wind cult seek to conjure up is that Germany’s Energiewende has involved a seamless “transition” away from “dirty” coal-fired power to total reliance upon wondrous wind and stunning solar. In truth, the supply and pricing chaos delivered by wind power is all but wrecking Germany’s grid. Germany isn’t really ‘powered’ by sunshine and breezes, it’s powered by French nuclear plants; Polish coal-fired plants; and its own fleet of lignite burning Kraftwerk. 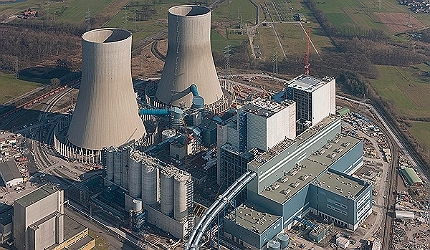 Over the last decade, despite throwing close to €1 trillion at wind and solar, Germany has been quietly refurbishing old – and building completely new – coal-fired power generation capacity, such as the 1,600 MW plant at Westfalen in the Uentrop area in the city of Hamm in North Rhine-Westphalia, completed in 2012 (see below). Bizarrely – if the object of German energy policy was reducing CO2 emissions in the electricity sector – Germany determined to scrap its fleet of nuclear power plants in an utterly hysterical reaction to the tsunami that hit the nuclear plant at Fukushima (a place where no single fatality was recorded as a result of a minor radiation release). Nuclear power is the only stand-alone power generation source that generates reliable power and no CO2 emissions in the process (hydro and geothermal satisfy the latter criteria, but are tied to geography, geology and topography). Having pulled the plug on its nuclear plants, Germany was left with two options: refurbish and build coal-fired plant or import reliable power from its neighbours, principally France and Poland. Germany has done both, but it’s still clearly insufficient to power what has always been regarded as Europe’s industrial leader. Now, noticing Germany’s power pricing and supply chaos, China is determined to plug the gap. China is building a new ultra-efficient coal-fired power plant every other day and adding serious nuclear power capacity to its already impressive hydro power capacity, with a view to supplying Germany with power via ultra-high voltage transmission lines. Needless to say Germany’s Energiewende is hardly the seamless “transition” to wind and solar power that its acolytes would have us believe. Westfalen: Germany’s energy future is as good as coal. Germany imports energy from French nuclear and Polish coal fired plants. You see folks something is not right here. It simply does not ‘stack’ up. There are tens of thousands of wind turbines out of operation and rusting away. A monument to the madness of the Greenie Mad Religion. They will have to be dismantled and scrapped. Who pays. Even when the wind does decide to blow, windmills still fail! Think about that for a minute. “In truth, the supply and pricing chaos delivered by wind power is all but wrecking Germany’s grid. Germany isn’t really ‘powered’ by sunshine and breezes, it’s powered by French nuclear plants; Polish coal-fired plants; and its own fleet of lignite burning Kraftwerk. Excellent review by Peter Gosselin of NoTricksZone and STT.